NORMAL* – This horse shows good alignment, with no unnecessary rough edges. Though not present in all horses, this picture illustrates both Canine teeth (in the space between the incisors and molars) and Wolf teeth (tiny sharp teeth right in front of the molars). 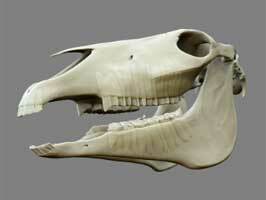 *Wolf teeth are usually removed when a horse is young to avoid pinching against the bit. HOOKS – This horse has no Canines or Wolf teeth, but has abnormal hooks on the front molar in the top arcade and the back molar in the lower arcade. WAVEMOUTH – This horse shows abnormal wearing of the molars, which over time has resulted in a “wave” formation. Horses have hypsodont dentition, which means they have reserve-crowned teeth and enamel extending past the gum line, providing for extra wear and tear. Their teeth are continually erupting (or “growing”) as they age. In a perfect world, as horses eat, their lower teeth would grind evenly against their upper teeth as both sides steadily grow out As it is, however, any number of factors interfere with that ideal and horses’ teeth instead wear unevenly, producing sharp points that can cut the tongue and the inside of the cheeks, waves that can “lock” the teeth into an inefficient and/or painful pattern of chewing, hooks that can make for uncomfortable bit-wear or cause gouging in the opposite gum line, and many other problems that can have detrimental effects on the quality of a horse’s life. In addition to normal wear & tear, many dental issues are not obvious. Horses don’t necessarily have to be losing weight, dropping feed, or performing poorly to have severe dental abnormalities. Many problems can exist in the back of the horse’s mouth and cannot be seen without proper sedation or speculum and oral exam. In order to combat these issues, it is a good idea to have your veterinarian do a regular dental exam and periodic dental equilibration or “float”. A dental float is the process of filing off those sharp points that form on the horse’s continually erupting teeth. It keeps your horse comfortable and maintains a proper relationship between the upper and lower arcades, which can develop into a serious problem if unattended over time. Some horse owners have made the comment that it doesn’t seem like horses should need this kind of attention to their teeth. There are, however, many factors to consider when comparing feral herds to domesticated horses. JVC power floats have a rotational diamond grit disc, which are not tissue abrasive. In the hands of a trained veterinarian, they have safety advantages. The disc grinds hard surfaces without damaging soft ones. For example—our doctors can show you—if you hold the pad of your thumb against the disc while it’s in motion, it doesn’t remove skin, but then again, it will grind your thumbnail right down. Compare this to hand floats, which are more akin to a farrier’s rasp, and how easy it is to cut your hands on those. The rotational feature also makes it safer to work on rear hooks because the circular motion that can be easily controlled versus a back and forth motion that can damage the gums at the back of the mouth. The power float also helps reduce the time taken for the procedure, allowing for minimal discomfort. A lay-person who performs dental work on horses without the benefit of a veterinary degree is referred to as a “Lay Dentist”. We should probably start off by saying that it is not legal for a lay dentist to sedate or perform dental work on horses in Indiana. There are no certifications or educational requirements that need to be met, and the horse owner has no recourse if something were to go wrong as a result of having a lay dentist work their horse. The problems that can arise from improper floating are numerous and can be severely damaging. Some of the damage may not be visible and its consequences may not show up for years. There is a delicate balance between taking enough enamel, and taking off too much. Not enough, and your horse is still uncomfortable, too much, and he may not be able to chew properly because there is not enough grind left in his teeth or the upper and lower arcades are not properly aligned. Damage can also occur to the pulp and root of the tooth. A lay dentist also does not have the benefit of whole-horse veterinary education, and are subject to the possibility of not recognizing related medical issues. Additionally, there is the concern about taking proper steps to avoid the spread of bio-hazards and diseases, including zoonotic diseases, which can spread across species to pets and humans.